Finance Minister Pranab Mukherjee is either incredibly clever or a budding illusionist. Little else can explain his presentation of the Union Budget on Monday, February 28. In his 110-minute speech, the Congress Party's principal troubleshooter had his audience convinced he was ahead of target in reining in the government's fiscal deficit, or the gap between the Centre's expenses and income. The applause at the end of the performance is a testimony to the finesse of Mukherjee's art: stock markets, measured by the Sensex, the benchmark index of the Bombay Stock Exchange, jumped more than 500 points in intra-day trading before the reality tucked away in fine print dawned on investors. The Sensex posted a stronger climb, 3.5 per cent, the highest in a single day in 21 months, on Tuesday, with bullish investors convinced they were on the cusp of, well, a bull run. A run they probably thought would be fuelled by dollar inflows with investors abroad being allowed to invest in Indian mutual funds. 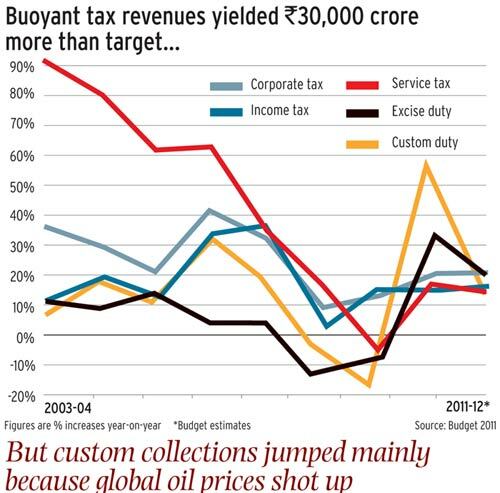 Mukherjee kept the service, excise and custom tax rates unchanged at 10 per cent, which will probably be the level at which the Central Goods & Services Tax will be set when it is rolled out in April 2012. The exemption for income tax was marginally raised by Rs 20,000 - benefitting only men - while a minor uptick in minimum alternate tax on book profits to 18.5 per cent was counterbalanced by a lower surcharge on corporate tax on Indian companies. These - and dozens of other small measures - all added up to what analysts and newspaper dailies called a "please-all" budget. Chief executives, heads of brokerages and bankers were near-ecstatic that the Finance Minister had seemingly achieved the impossible: balancing the government's budget delicately in a year of five assembly elections, high social spending and an economy that threatens to chug along at a slower speed. All this, without raising tax rates. The Confederation of Indian Industry, or CII, the most powerful of the business lobbies, expressed happiness over most of the budget proposals, saying, "CII is particularly happy that the Finance Minister has retained the same rate for excise duty and service tax." Harsh Mariwala, Chairman of personal care products maker Marico, echoed the sense of relief. "Certain fears regarding increase of excise duty and service tax have been put to rest," he said after watching the budget speech at the Federation of Indian Chambers of Commerce and Industry office in Delhi. He will be the next president of the industry body. The biggest cheer for Mukherjee has come because the budget documents show he has reduced the fiscal deficit as a percentage of gross domestic product, or GDP, from 6.4 per cent in 2009-10 to 5.1 per cent in the current fiscal year, which is lower than the target of 5.5 per cent he had set himself in the last budget. But dig a little deeper and you see the fiscal deficit in 2010-11 is estimated to be nearly Rs 20,000 crore more than the target. How come? Because the Central Statistical Organisation, or CSO, early in February, revised upwards growth in the GDP - the denominator in the fiscal deficit - GDP ratio. This means that the fiscal deficit target of Rs 381,408 crore as a percentage of the new GDP figure would be 4.8 per cent and not 5.5 per cent. In effect, with the fiscal deficit at 5.1 per cent of GDP, the Finance Minister actually missed his target by 30 basis points and did not beat it by 40 basis points. In other words, the budget presents an impression of a better-than-targeted number. "The credit for the fall in fiscal deficit as a percentage of GDP is not due to the finance minister but the CSO," says M. Govinda Rao, Director, National Institute of Public Finance & Policy and member of Prime Minister Manmohan Singh's Economic Advisory Council. Bharatiya Janata Party's Yashwant Sinha called Mukherjee's budget "pedestrian" and "timid". In the pre-budget issue (Buy Me, Buy Me Not , dated March 6), Sinha, who has presented six Union Budgets, had said finance ministers and prime ministers need courage while framing a budget. "If they can't face up to these challenges, then they should not be there," he said. "Oil prices are beyond our control. If they go up, we will raise supplementary demands for grants"
Numbers can be made to look good or bad depending on how they are juxtaposed.This is the oldest trick in every finance minister's book. Even so, there are certain leaps of faith in Mukherjee's third budget in recent years that seem odd, if not deliberately misleading. The fiscal deficit target for 2011-12 of 4.6 per cent is based on the projection that the government's spending in the coming financial year will rise less than 4 per cent over that in 2010-11. The fine print of the budget reveals that the lower spending projection is not due to some fierce belt-tightening planned by the government, but is based on the assumption that global petroleum product and fertiliser prices will not vary much over the next year from the level at the time of drafting the budget. So, at a time when crude oil prices are hardening on the back of a political crisis sweeping West Asia, Mukherjee has actually set the fuel subsidy bill 40 per cent lower. Even assuming the crude price stays between $90 and $95 a barrel, Citigroup India's analysts expect a fuel subsidy burden of Rs 50,000 crore against the budgeted Rs 23,600 crore. If the price stays below $90, says D.K. Joshi, Chief Economist at ratings agency Crisil, the government could keep its subsidy bill down. "It appears that they are hoping that the political tensions in West Asia will ease," he says, adding a possibility could be that diesel prices are linked to market. "But that appears unlikely at the moment." At the finance ministry, the outlook is unusually blase, a mood rarely seen in its North Block offices in New Delhi under previous ministers who have held the key portfolio. "Oil prices are beyond the finance ministry's control so if they do go up, we will raise supplementary demand for grants from Parliament," says Finance Secretary Sushma Nath, explaining the budget math to BT. The other big hole in Mukherjee's calculations could come from the government's food security Bill. Though he reiterated the United Progressive Alliance, or UPA, government's commitment to a food security law, Mukherjee has not budgeted for it, keeping food subsidies at the same level as in 2010-11 at a time when food price inflation is stubbornly high. According to Citigroup India's analysts' projections, the additional burden once the law comes into force could range from Rs 23,230 crore to Rs 35,360 crore. Minutes after Mukherjee's speech ended in Parliament, Prime Minister Singh hinted the numbers projected in the budget calculations were not watertight. "…We cannot be too certain that …the arithmetic will work the way we want it to work," Singh said in an interview telecast on Doordarshan. "We must have ample scope to contribute to fiscal consolidation." In his speech, the Finance Minister sought blessings from God Indra and Goddess Lakshmi, but later in the year it is the Parliament's best wishes that the UPA government is likely to seek, for the budget has not even accounted for any rise in outlays for the Mahatma Gandhi National Rural Employment Guarantee Scheme despite the likelihood of wages going up following the recent decision to index them to inflation. In the budget for 2010-11 too, Mukherjee had projected the slowest growth in spending in five years - a target he failed to achieve in the absence of any trimming of public spending, which sent him back to Parliament with demands for supplementary grants more than twice the average sought by previous finance ministers, on more than one occasion. This was despite a neverbefore bounty - Rs 70,000 crore more than budgeted - raised by the government through auctions of third generation telephony and broadband wireless access licences and spectrum rights. It is very unlikely that the exchequer will have recourse to such a one-time source of revenue next year. Mukherjee, who BT wrote about in October as being a "distracted finance minister" (click through http://bit.ly/staticonthefmchannel ), is relying on two factors to save himself from the embarrassment of missed targets. These, Finance Secretary Nath explained, are buoyancy in tax collections - assuming the economy continues barrelling along - and the capacity constraints at the state level in utilising disbursements from the Centre. "The fiscal deficit target and spending figures might not go too awry as we can always reallocate unspent funds from a department to a deficit one as we did in 2010-11," she says. But the bet on the domestic levies could be hazardous with early signs of the economy decelerating (India Slowing , February 20), as analysts noted. "With this budget the government has projected a tidy house by underprovisioning for expenditures and leaving itself very little room for manoeuvre should revenue buoyancy not pan out as expected, or the rise in commodity prices breaches threshold expectations," Japanese securities house Nomura noted in a report after the budget. On the push for growth - GDP is projected to grow at 9 per cent for the budget calculations against the estimate of 8.6 per cent in 2010-11 - Mukherjee didn't sweat. He fell back on the age-old Congress placebo of committees, announcing a total of 11 of them, from one to recommend how to auction mining rights and other natural resources along lines of the 3G auction to another on financial sector reforms. Though the budget speech's announcement on subsidy reform to be attempted through direct transfer of cash to farmers and consumers for fertilisers and fuel is a positive step, gains on the ground could be slow in coming. Another feel-good but hardto-realise goal is raising the contribution of the manufacturing sector to GDP in 10 years to 25 per cent from 16 per cent today. Intermittently, in the speech, a major announcement seemed round the corner, for Mukherjee was candid about the controversies troubling the UPA government. He talked of black money, corruption, governance deficit and food price inflation. But, the fixes he proposed seemed too limited. For instance, he announced at least 11 different allocations under various heads of the Rashtriya Krishi Vikas Yojana and other similar schemes to fight food price inflation but each one was kept at a mere Rs 300 crore as if it were meant for a tiny Pacific Rim island nation rather than the second-most populous nation on earth. As the father of India's Green Revolution, M. S. Swaminathan says of structural agriculture reforms: "Most of the programmes from last year's budget are yet to be implemented properly or have an impact." Not all of that implementation is the finance ministry's responsibility. The ministry's primary agenda is to raise revenues, especially from taxes, which the budget projects will grow 18 per cent to Rs 664,457 crore, and make allocations. Delivery of services and monitoring of outcomes is in any case the job of the state governments, Central ministries and the Planning Commission. Then, if the GST and Direct Tax Code kick in from April 1, 2012 - a twice revised deadline - the ministry will be left with little leeway. In fact, Nath admits that in two years, finance ministers will have to do away with the 'Part B' on tax proposals in budget speeches. By abdicating blockbuster reforms, typically flagged in Part A (See 10 Budgets That Changed India, page 54), he poses a Darwinian threat to future budgets. Yet, the 75-year-old was exuding confidence. "The Number 3 happens to be my lucky number," he joked mid-way into his budget speech. In the last two budgets, Mukherjee rode on luck rather than smart budget making to deliver results. Will he get third time lucky?